My mother drives a 5 year old VW Golf, and broke down last week when the car just refused to go any further. This is neither big news, nor related to the VW current fiasco, but it did start me thinking about brands who have been through disasters, and their handling of and recovery from, their situation. I have read a variety of articles on crisis management over the last few days, ranging from one by the brilliant by Richard Morris, to the obscure and slightly off the wall. 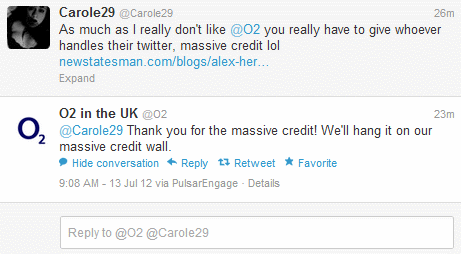 One author claimed that the best way to handle any crisis was to immediately ‘control the conversation about the brand’. In my opinion this sounds like a sure-fire way to drive brand reputation even further into the ground, and in this digitally enlightened world, also an impossibility. Another helpful suggestion was to create quality sub-pages to push the negative reviews further down the page. If lack of transparency got the brand into their particular situation, this doesn’t seem like the best way to re-engender trust to me. Apparently (according to my mother who is never wrong), I didn’t learn to verbalise the word ‘sorry’ until my late teenage years. As I have left my angry teenage years behind me, I now find it to be one of the most cathartic in my dictionary. When brands have exponentially got it wrong (the whole banking sector springs to mind), just say ‘sorry’: publicly, bravely, and without compunction. Don’t hide behind corporate jargon or expensive lawyers. Just come out and say how wrong you have been and outline a plan to get things back on track. Be bold in any marketing activities, whilst maintaining customer sensitivities. Acknowledging mistakes publicly goes a long way – just look at the likes of Tiger Woods and Martha Stewart! A good example of this is Tesco, who got themselves into trouble during the infamous horse meat scandal, for selling beef burgers that were found to contain horsemeat. 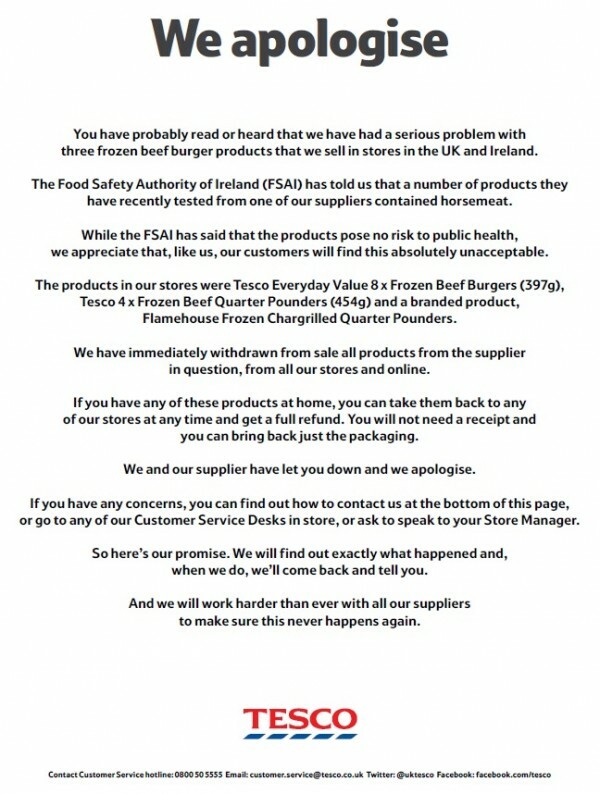 They placed full page ads in the UK press, withdrew all said products from the shelves, and offered a full refund to any customer who had purchased the product. Whilst the initial tendency is to panic, brands must avoid being obviously fake. It is critical that any public apology, especially through social media, is genuine and without PR spin. Deleting negative posts is clearly a big no-no – rebuilding trust and reliability means taking a chance on complete honesty and transparency. 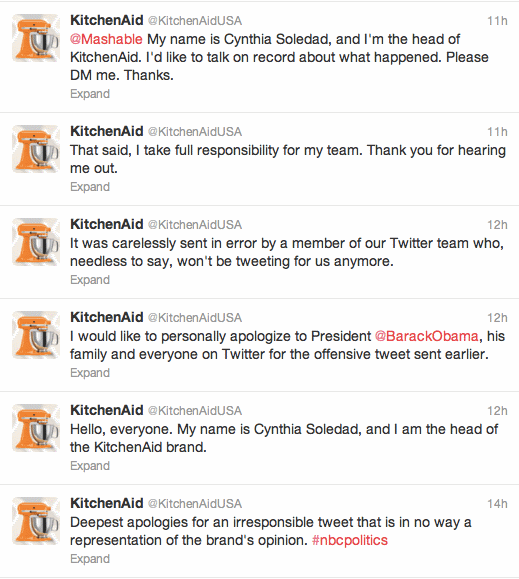 In the US, a team member for Kitchen Aid accidentally tweeted an insensitive comment about President Obama’s grandmother during an election debate. Literally minutes later, the head of Kitchen Aid personally tweeted an apology, and ensured that the person responsible was no longer working for the company. One of the worst things to do, is to disappear from view to the outside world. Equally, internal employee handling is critical. For staff members to be engaged in any come-back is vital – as much as the public needs to see how the brand is planning rehabilitation, the people making it happen have to believe it too. Companies experiencing disasters need to be led by strong management who have a clear action plan for change and a timeline for delivery. A simple, consistent and clear plan of response is vital that can unite both the organisation and with the public. My grandmother always said that we have 2 ears and one mouth for a reason. Understanding how the public is responding in times of crisis is critical to knowing how to respond, react and address the issues arising out of the strategy. There has never been an easier time to do this, with the wealth of social media platforms and analytics tools that will alert any company to the conversations going on. In my opinion, this is as applicable to customers and suppliers alike. Brands need to ensure that the suppliers who have helped them deliver success are there to help them out of the situations they may find them in. The same goes for employees. If you can unify internal teams to galvanise the rebuilding programme, the loyalty paid during times of crisis, will be significant. And finally, learning lessons from what has happened, to prevent the same situation recurring, is vital. A thorough understanding of the process undertaken during any type of crisis, and understanding what could have been done better, quicker, or more effectively, will help any brand to deal with and manage crisis more effectively.